Sorry, but this section is under construction. Soon. What would you like to see on the site? 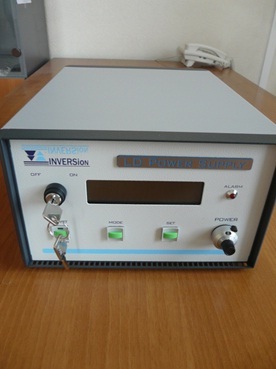 Inversion-Fiber Co Ltd. developed reference single-frequency fiber laser with two output wavelength: 1550 and 775 nm. Fig. 1 The laser appearance. 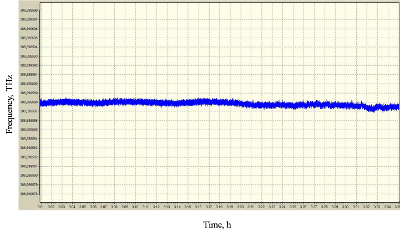 Absolute frequency stability for 1550 and 775 nm lines is < 1 MHz and < 1.5 MHz respectively. Fig. 2 Long-term frequency stability for 775 nm line. The use of fiber lasers of GFL series in the Raman spectroscopy. 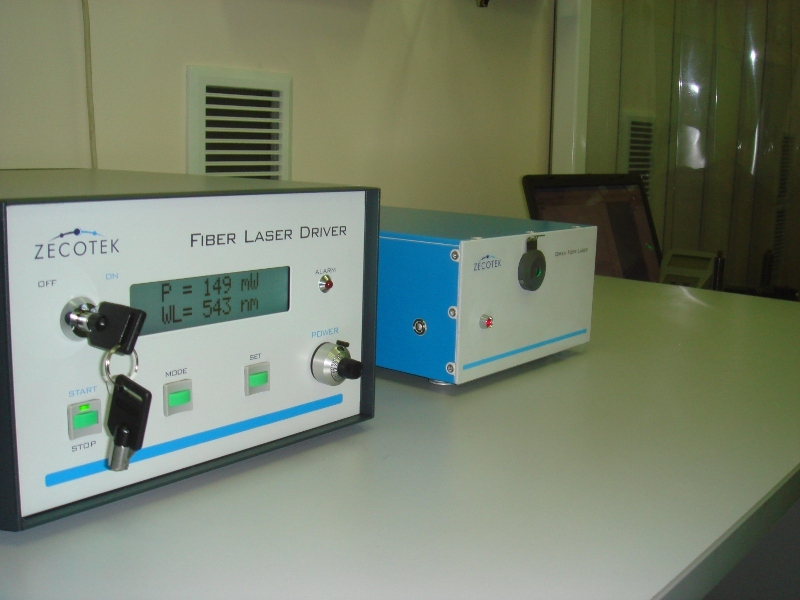 One application of the GFL series lasers developed by “Inversion-Fiber Co. Ltd.” is using for Raman spectroscopy. Powerful fiber laser with CW radiation in the green range may serve not only as alternative sources with respect to conventional lasers (in particular, argon-ion laser with a radiation wavelength of 515 nm and DPSS lasers), but also exhibits a few advantages in comparison with the existing laser sources. Figure 2. 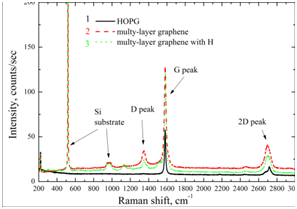 Graphite and multilayer graphene spectra mesured with the spectrometer T64000 Horiba Jobin Yvon using GFL-540-0,35 laser. (client coordinates: http://www.atic.nsu.ru/node/6 ). More information about the features of fiber lasers of GFL series in spectroscopy - here. In the Company "Inversion Fiber" developed fiber lasers in the visible spectrum with a coherence length of emission up to 10cm. This device is a good tool as a station read / write holograms in photopolymer materials. The laser provides an output optical power of 1 W with a spectral width of less than 5 pm, and with an additional option - 200 mW and 1 pm. 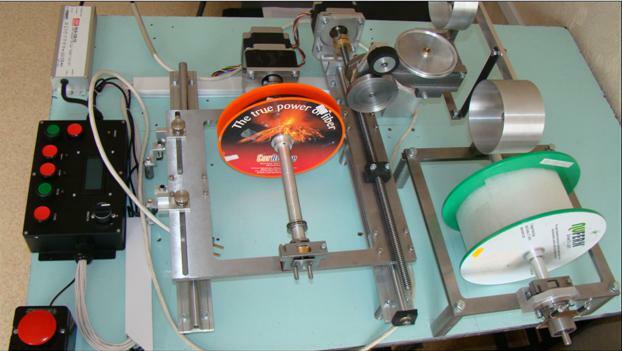 The company "Inversion Fiber" has developed and produced an automated fine fiber optic wire respooler for their own needs. The respooler allows to rewind smoothly in automatic mode, any number of fiber reels from one to another with high accuracy. Laying fiber is turn to turn, by rows. 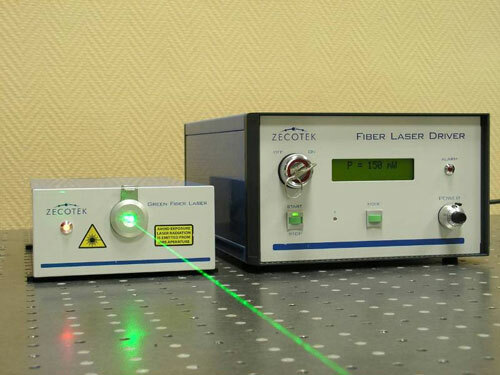 Blue-green fiber laser - an alternative to argon laser! 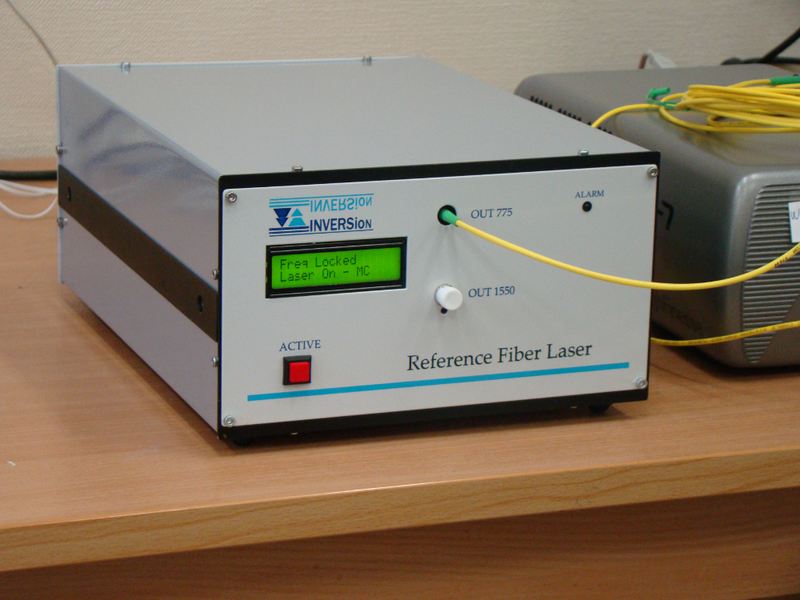 The Company "Inversion Fiber" produced a green fiber laser GFL-515 with increased coherence length. This device is a source of emission in the green spectral region at a wavelength of 515 nm and is comparable to the characteristics of an argon laser. At once, the laser GFL-515 is a compact, does not require adjustment, cooling systems and high energy costs. Fiber laser GFL-515 has a coherence length about 2 cm, which is enough for holographic applications, such as writing / reading of holograms in the visible region. 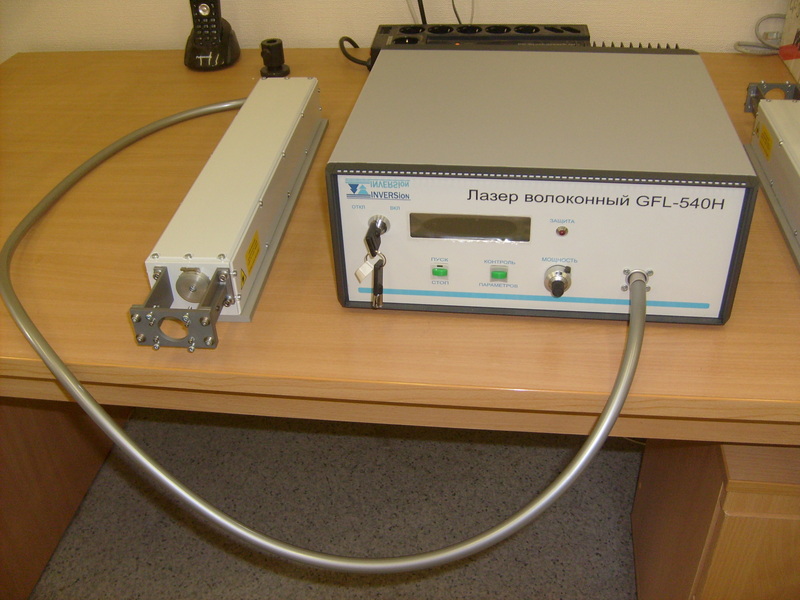 Therefore, GFL-515 is a great alternative to argon laser at a wavelength of 515 nm and power up to 100 mW, and is applicable to optical holography. More read and download information about the new laser GFL-515-0.1, you can on our page GFL in our products or updated sintered.. The Company is ready to produce laser in a standard specification, and the parameters for a specific order (increased power, the coherence length). The stabilized source of emission - a new class of devices designed and manufactured by our company for the scientific and practical applications. The source generates a multimode optical emission, stable wavelength (975 ± 1 nm), and current. The source is equipped according to the customer from 1 to 3 - the number of laser diodes, with the possibility of an independent fiber output of each diode, or integrated with the fiber pump combiner. Optical output power is 20 W when using three laser diodes. Can be supplied without laser diodes - in the form of a current driver. Acquainted with the detailed description and technical specifications you can here.. 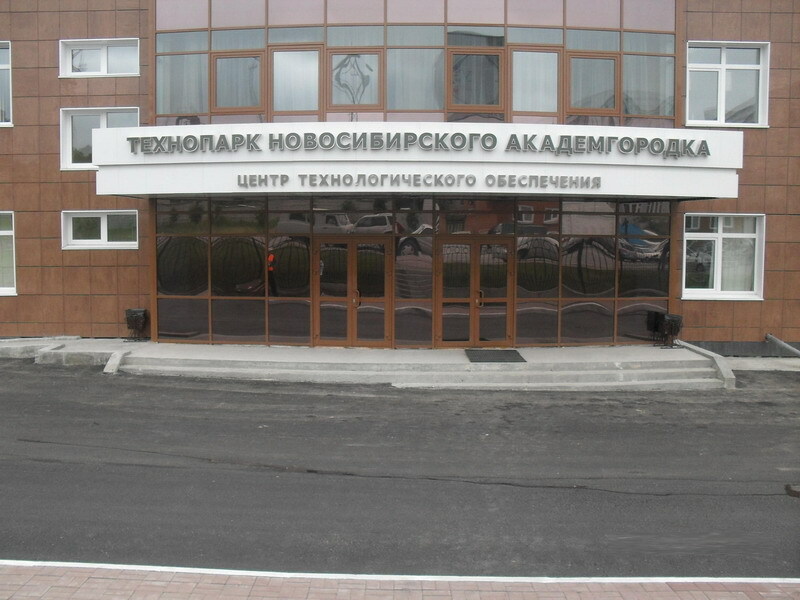 The company "Inversion Fiber" became a resident of Technopark of Novosibirsk Akademgorodok. March 1, 2011 Council of Technopark approved the introduction "Inversion Fiber" in this esteemed organization.